Meet Victoria Adams. A Revolutionary War badass who infiltrates a British encampment. She knows how to handle herself, but things get dicey for our red-haired heroine. Jump to the present where the modern Adams runs afoul of the law only to realize she's in deeper trouble with some mysterious forces and she's quickly on the run. She begins to have memories of herself during the Revolution, of a life so vivid she can even recall her death. It plays out a little like Steve Rogers as Jason Bourne (she predates Captain America by the way). I wanted to love this issue since it was announced. The anticipation and expectations grew even through the delayed release. 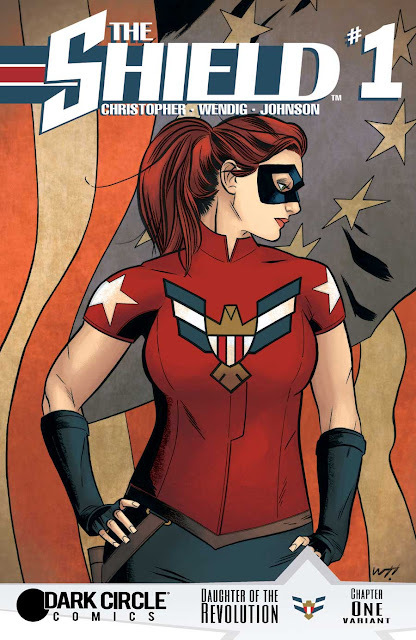 The previews of the covers were gorgeous, featuring a redhead with a strong build looking patriotic and ready for action. I liked 'The Shield' #1 but didn't adore it as much as I thought I would. The story moves fast but perhaps too fast. It reads as if it came from two different minds and it did. Adam Christopher and Chuck Wendig are fine novelists, but there's an urgency to get this story out. It's almost as though there's a checklist of items or beats they have to hit in the first issue. The backstory, the present day dilemma, the images of a past life, the convenient getaway, establishing the villain, the hero realizing who she is or was gets checked off every few pages. There's very little time to develop any character and the convenient plot devices moves the action forward but with little resonance. An all-too-helpful detective, a virtual moustache-twirling villain, and at times confusing panels hinder what should have been a fantastic debut. The artwork fares much better but the script finds a way to interfere at times. Drew Johnson does an incredible job of designing landscapes and characters. Only when the action gets going that occasionally the sequence of events gets muddled. While I enjoy Rachel Deering's letters the caption boxes cover up the action and on some pages they suffocate the life out of the story. The layouts at times are cluttered and jumbled. Kelly Fitzpatrick's muted colors give the book a distinct understated look. It's mostly great art that sometimes ends up in a 12-car pileup. 'The Shield' #1 didn't live up to expectations but the DNA of a great series is there. A reborn American hero embodied by a more muscular version of Jessica Chastain has a ton of potential. With some character development and cleaner layouts Victoria Adams could become the face of Dark Circle Comics and the flagship book it deserves to be.